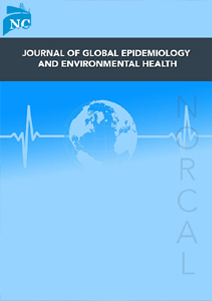 Journal of Global Epidemiology and Environmental Health is an international, peer reviewed, open access, scientific journal publishing original research, review, mini reviews, case reports and studies, short communications, letters, editorials, etc. from all the aspects of disease control, public health and other factors affecting communities as a whole.We promise researchers, academicians, healthcare professionals, professional bodies, healthcare organizations to provide a forum to publish their research work online through an open access platform. Journal of Global Epidemiology and Environmental Health journal’s main aim is to publish manuscripts in all the aspects of disease control, public health and other factors affecting communities as a whole, and all the manuscripts received under goes attentive peer review process before publication. Our journal strongly supports the developments in the scientific community, and enhances access to high quality research work available online in our journal home page. Our journal mainly aims audience like clinicians, academicians, researchers across the planet to disseminate their high-quality research work and perspectives in the fields of epidemiology, public health and community medicine.It acts as a forum for all the authors to define their attempts in possible control of diseases and to find a solution to eradicate health care issues affecting communities as a whole through an open access platform.